A week from today about 2000 people are going to take their seats in the Artscape Opera house. The stage will be shrouded by an unlit scrim. It’ll all be very mysterious. 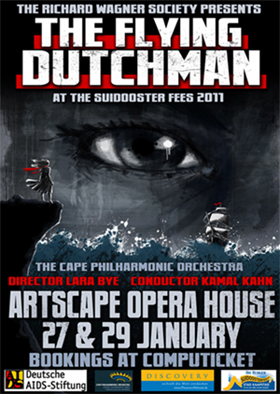 The Cape Philharmonic Orchestra will be doing their last minute checks and tuning their strings and making that really interesting low level cacophony that gets made before you her some serious music. The lights will dim, the conductor, Kamal Khan will take his place before the musicians and then it’ll start. The Flying Dutchman by Richard Wagner. 20 seconds in and an invisible brush will pass across the scrim, creating a living illustration of the ocean. I’m really glad we still have a week to go. It’s probably almost a year ago that Lara first approached me for the Dutchman; Sanjin and I had done the multimedia for her previous opera with the Wagner Society, Rossini’s La Scala di Seta in 2009, and were very excited for another. It’s been 2 years since then and our techniques have developed considerably as well as our understanding of each other as artists. What can we do this time around? I took lead on design – first gathering samples and inspiration for the style and then working through the beats of the story and music with Lara to storyboard the footage. I worked with ink and brush to evoke my main design focus, a painted world. The sea is vital to the story so I wanted everything, from the clouds to the rocks to have a sense of flow and life to them. The biggest contrast between Sanjin and I is in the realm of technology – he knows cameras and computers upstairs and downstairs while I am always trying to find a chunky, unpredictable analogue solution. But these 2 approaches complement each other well. I went about planning to capture footage in weird ways and he figured out how to make it look good. We ended up getting a glass drawing table built and then buying a fish tank for our effects. 2 weekends were spent dripping, smearing, brushing, stirring, pouring, seeping, folding, tearing, soaking, splattering ink, water, paper and glitter in a studio. 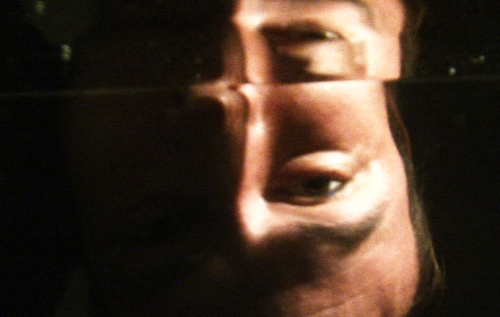 A lot of beautiful effects were found and filed but less than a quarter of the recorded footage will be used for the opera, the rest will be filed away for future reference on another project. The next phase was to create the drawings that would actually feature in the video – this was me sitting at a table with ink and brush churning out waves, masts, shorelines and brush strokes for animating. The big delay, and the reason I’m glad there’s still sometime before we put on the show, was filming the principals. Gary Simpson and Nkosazana Dimande only arrived in South Africa this month, and we could only get them into a studio 10 days ago. That’s a tight schedule for any kind of video work. The last couple of nights have been late ones with Sanjin and me staying up way past our bedtimes and drinking coke ‘til our kidneys complained. But it looks rad. Sanjin has been cooking with the editing and has really started to master After Effects (and my Photoshop skills have come in handy once or twice too). A couple more all nighters and then Tuesday night is the final dress rehearsal. We have 1 absurdly short section that we’re still really wrestling with. Absurdly short. 10 seconds. We wanted this to be the best thing we’ve ever done. This entry was posted in Projects and tagged Artscape, Cape Philharmonic Orchestra, Gary Simpson, Kamal Khan, Lara Bye, Multimedia, Nkosazana Dimande, Opera, Sanjin Muftic, The flying Dutchman, Theatre. Bookmark the permalink.